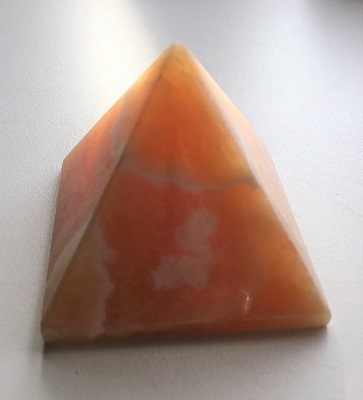 Swirls of white calcite pattern this wonderful tangerine color Orange Calcite pyramid from Brazil. 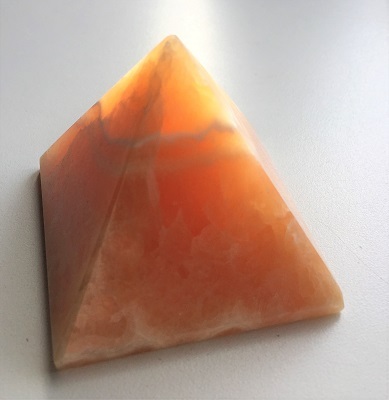 Swirls of white calcite pattern this wonderful tangerine color Orange Calcite pyramid from Brazil. Orange Calcite is an energy mover and resonates with the vibration of playfulness and encourages confidence. Helping to balance emotions, Orange Calcite removes fear and overcomes depression, lethargy and inactivity. 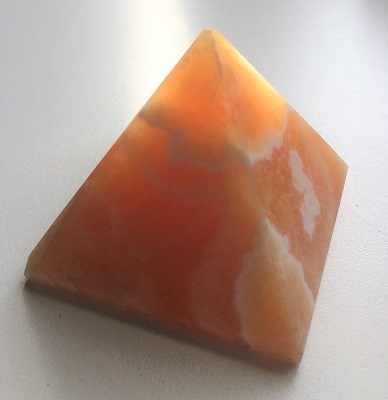 Orange Calcite helps one create new and innovative strategies to solve problems and to overcome stagnation in order to move forward and maximize potential. 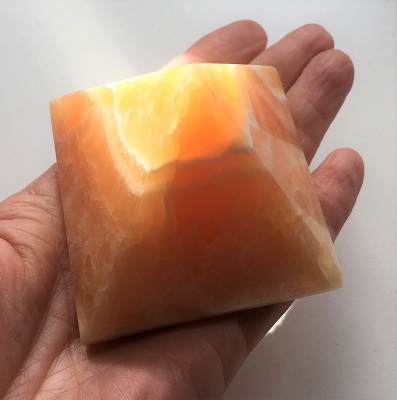 Orange Calcite helps one view circumstances from another perspective, encouraging one to see a solution beyond old patterns and past behaviors. This is an excellent stone for those involved in creative endeavors as Orange Calcite facilitates “aha moments” of inspiration. Orange Calcite’s uplifting “sunshine-like” energy encourages warm, fluid moving energy and circulation. In a chakra layout or healing grid, Orange Calcite may be placed to clear and activate the second and third chakra. Orange Calcite removes blockages from the meridian energy system. Orange Calcite is an excellent crystal tool for those experiencing shyness or social phobias. In healing, Orange Calcite supports the endocrine system and balances the hormones. Orange Calcite may also be helpful in healing and balancing ones metabolism, the gallbladder, digestive systems and intestinal disorders such as irritable bowel syndrome (IBS). Crystal pyramids enhance and focus the inherent properties of the crystal. Crystal Pyramids may be used to draw off negative energies and remove blockages from the chakras, replenishing with vibrant energy. Pyramids focus and amplify through the pyramidal shape and molecular structure of the crystal, and have been used to charge and preserve objects.